The room inside the station. Deep-Space Anomaly #0198 is a Forerunner construct cataloged by the UNSC. The construct appears to be a small Forerunner space station in the Soell System, seemingly in high orbit over the gas giant Threshold. The station's interior is composed of one octagonal room with series of catwalks connecting to the center and several corridors surrounding it. The four pillars in the center of the station's main room bear the Mantle glyph. 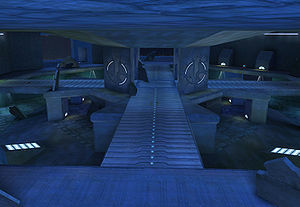 This anomaly is the site of the Multiplayer level Derelict in Halo: Combat Evolved.